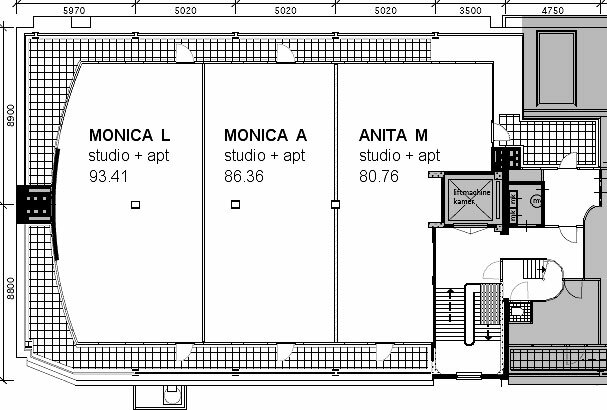 On this page are shown level-5 enclave's four living-spaces and level-6 enclave's three living-spaces. 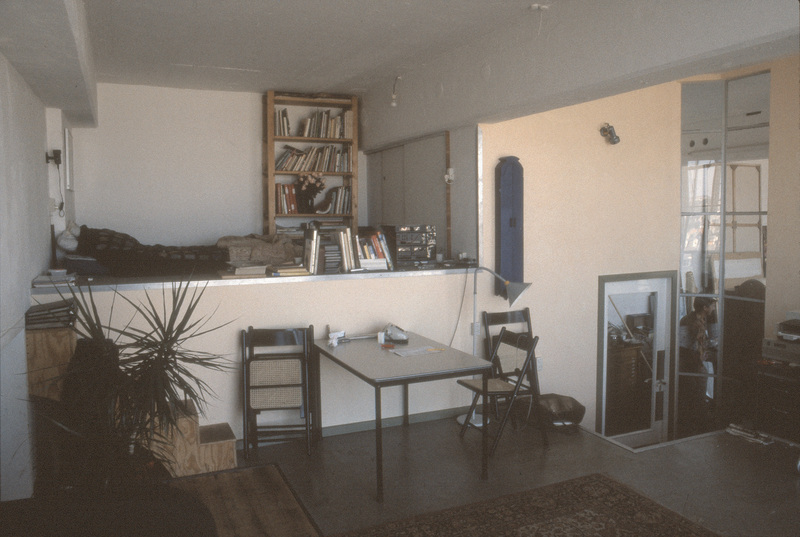 This studio/apt space began in ‘85 as one of the first two cement-block enclosures in Dacostakade: built by Fred van Otten as a ‘commitment to permanence’ when legalisation was still uncertain, “to keep spirit in” and ‘to affirm independence from external help’. 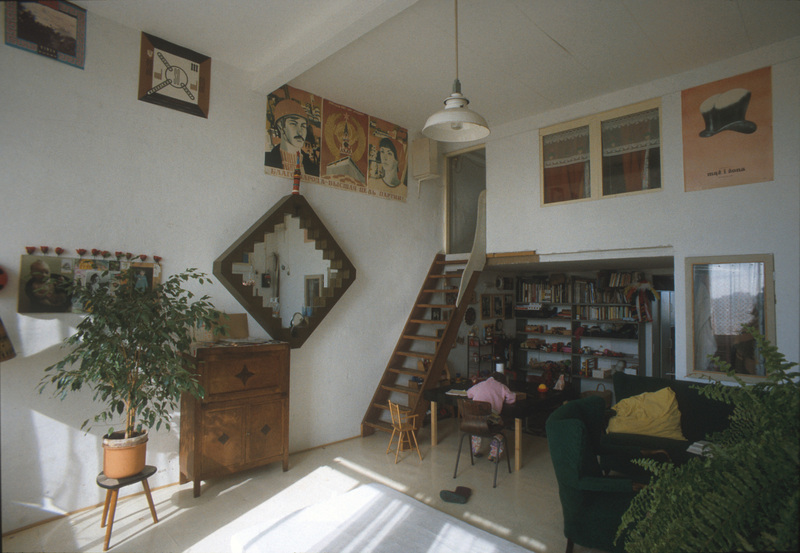 The work/living-space occupies a simple 7x17m rectangle along the Dacostakade side of Merkelbach, abutting the 1912 Hartcamp building from which it commandeers a small extra room. 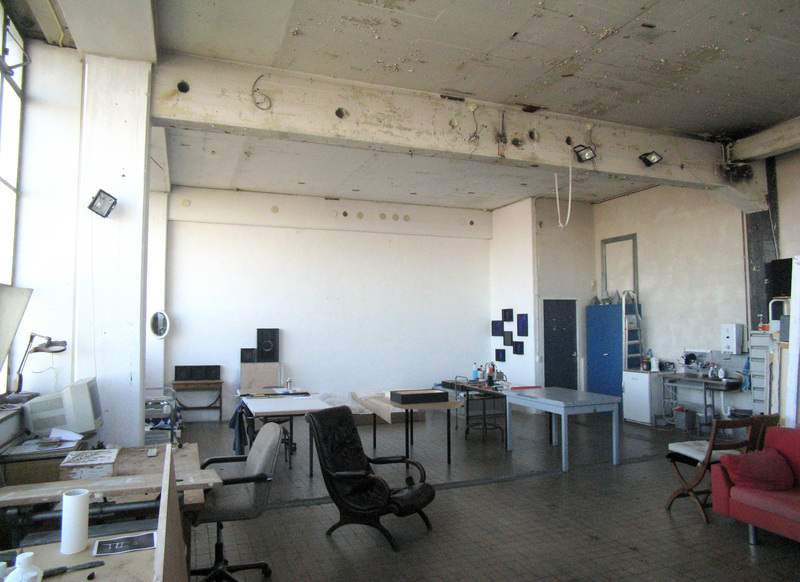 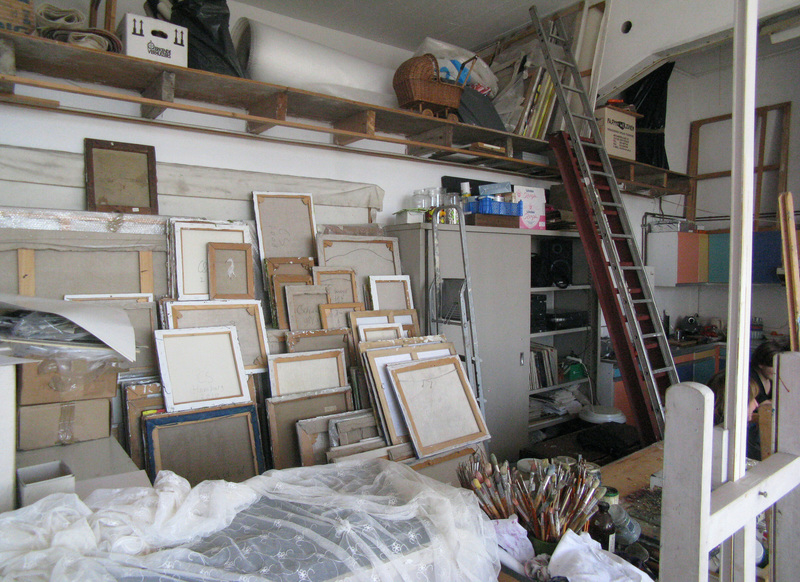 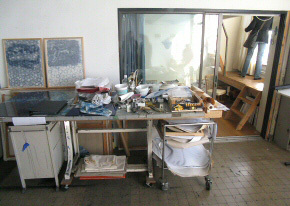 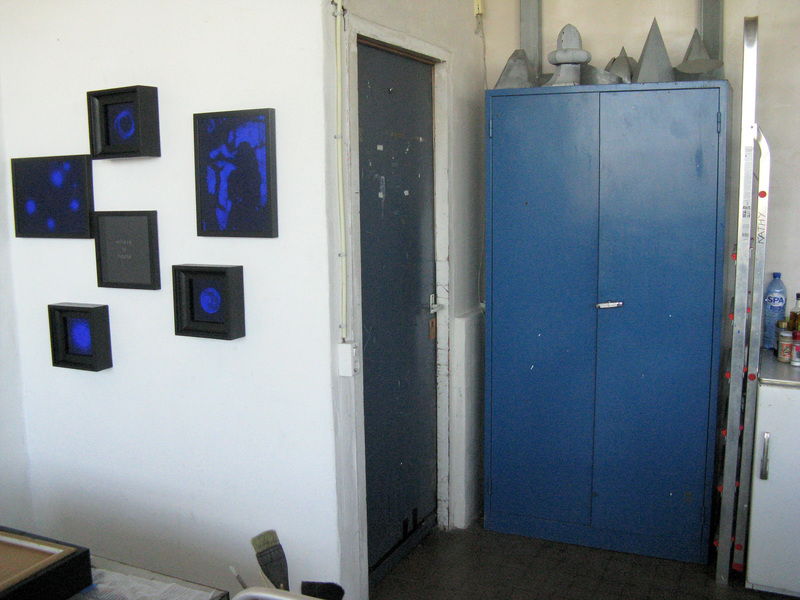 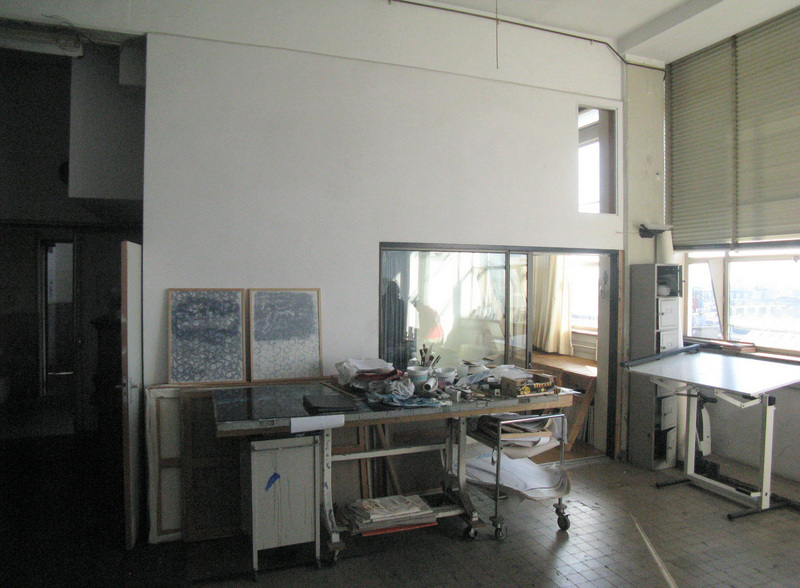 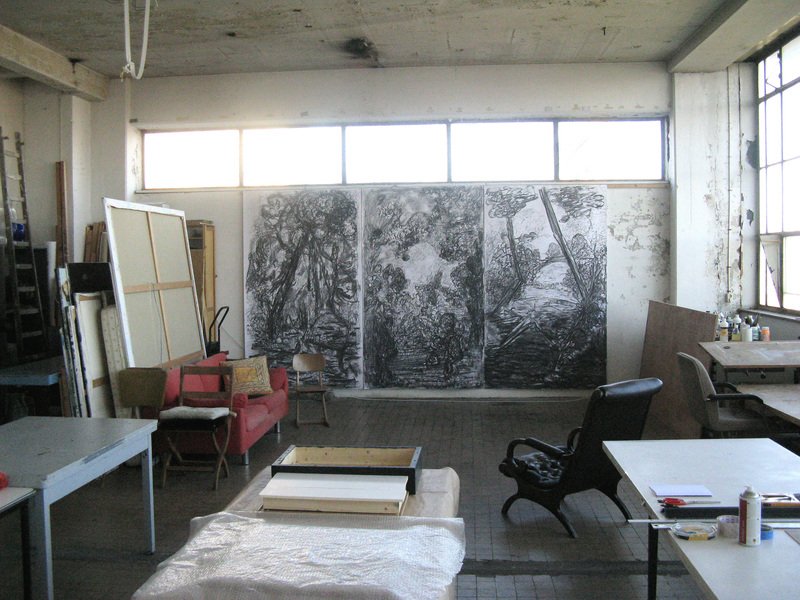 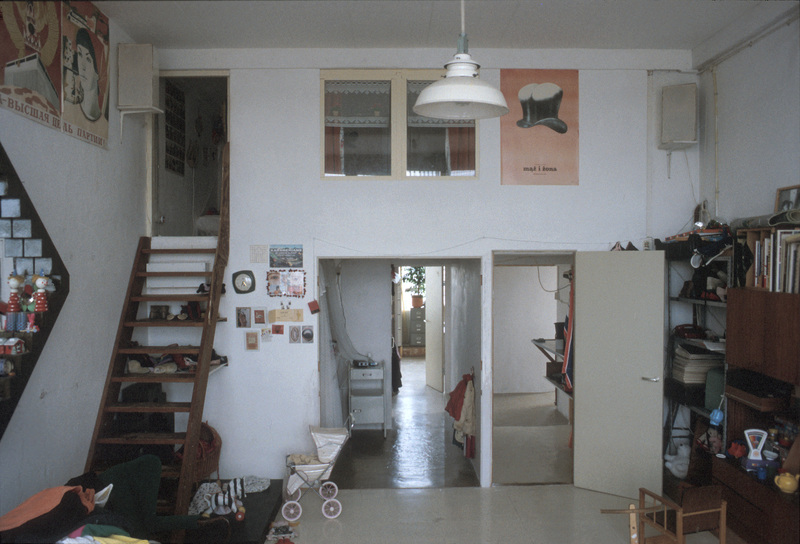 Theo moved into the bare cement-block space in 1988 and used it as a studio for two years before dividing-off five meters and constructing a living-space. 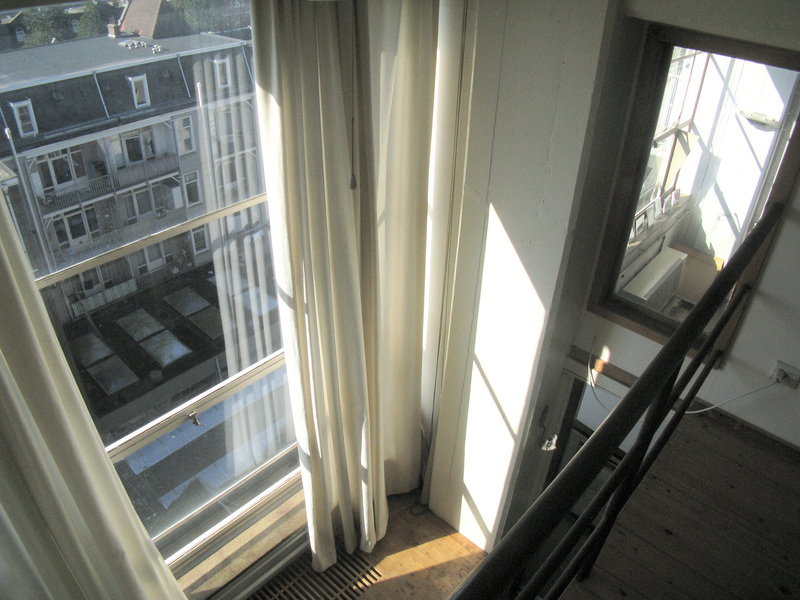 Via the narrow tall windows of the dividing wall one can see the exciting contrast of a raw 4 meter height studio sharing the same enclosure, concrete-structure, and fenestration with this elegant ‘city-apt’...at whose far end is one of those dream-like transits more common in the Silo: through a small door the clear modernity flips into the wood-tech and historicism of a narrow mansard room with a many-paned dormer window and heavy timber struts. 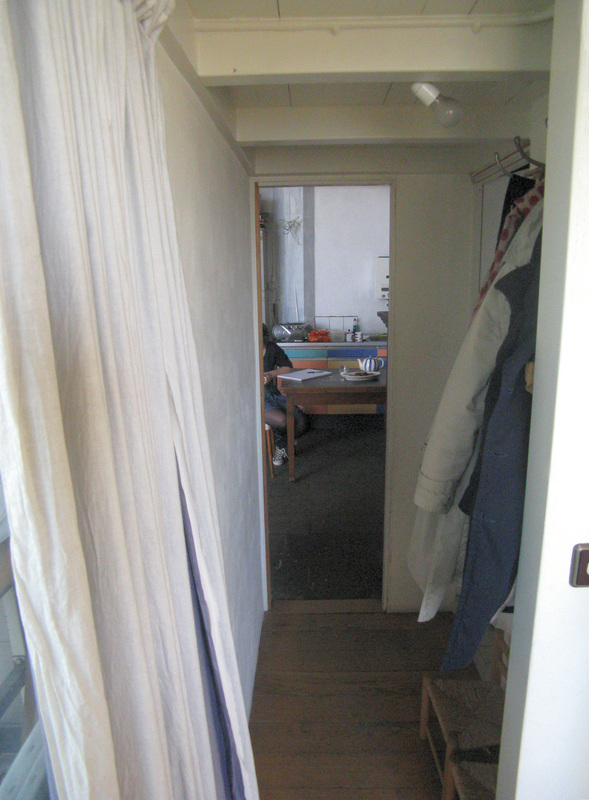 Access through an existing fire-door enabled this 2·5 meter portion of the adjoining 1912 building to be annexed to the apt as the (visiting) children's' bedroom. The wall between studio and apt is wood-frame and plasterboard with steel windows scaled and detailed to continue the rhythm of the Merkelbach glazing round the enclosure of the apt. 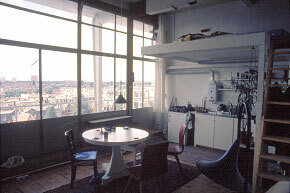 A new wood floor raised 1 meter to window level has given the apt a wonderful sense of face-to-face contact with the outside - the glazing is truly the face of the building: detached from the columns and with no projecting exterior sills - pressed against this glass from toes to head one sees over the canal and city to the palace and the distant Silo: 21 meters up and with no impediment to sight. 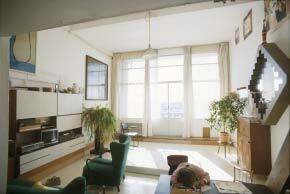 The raised floor reduces the apt’s height to a sense of comfortable enclosure and more efficient heating - under the floor is store-space and heater. The studio store-room cuts into the apt-space where it constitutes a 2·3 meter high bed platform. 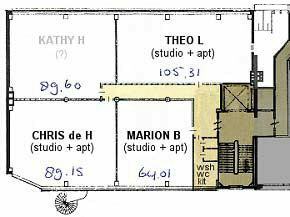 Apart from a studio sink the living-space is reliant on the enclave’s kitchen and wc (just opposite its front-door); Theo never intended complete self-sufficiency, but he may make a kitchen in the store. 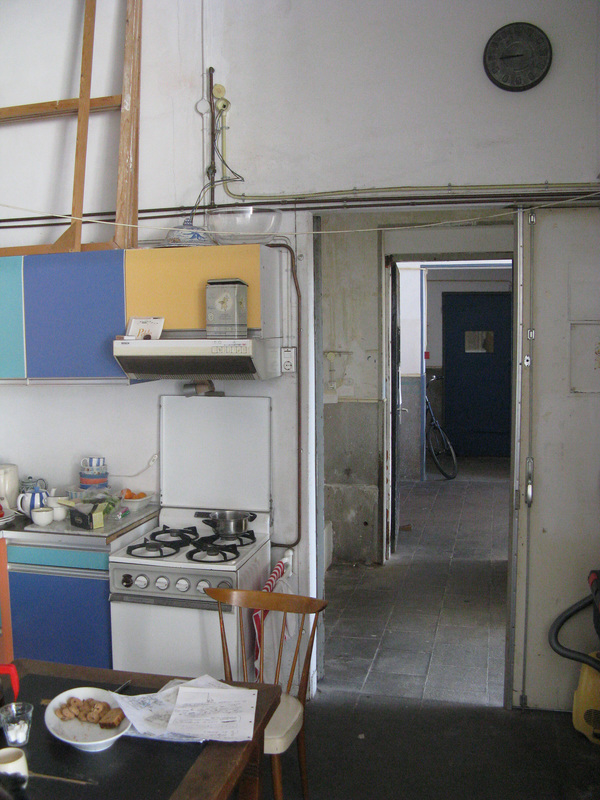 The complex apt-entry corner of Theo's dividing wall. 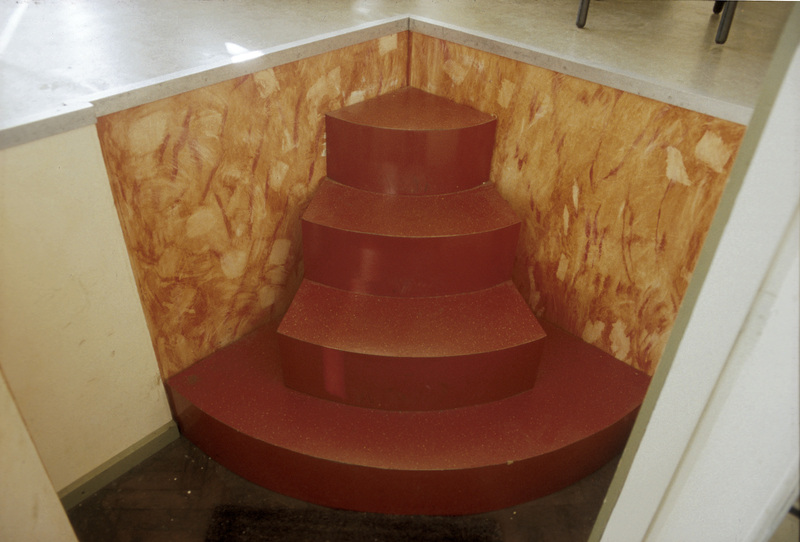 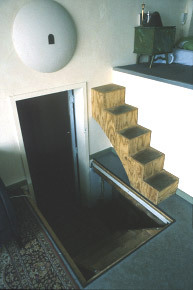 Steps (made 1988) from studio-level up onto the living-space floor - just inside its enclosure. Though part of apt-building, these were made (along with the bed-platform steps and tv-stand) as independent objects related to current painting subject-matter. 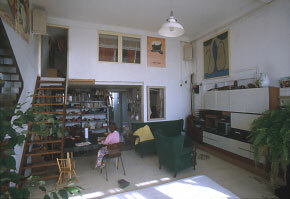 The domestic portion of the living-space occupies a complex volume. 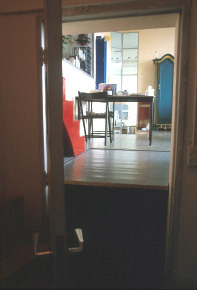 The raised floor necessitates cut-outs for entry steps: from the studio and down to the children's (Hartcamp) room; the bed platform surmounts the studio-store. 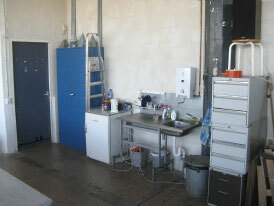 In the 4 years between this photo and the last an ‘inevitable’ amplification of facilities has occurred. In addition to a quantitative increase in means of storage and order (filing provisions) the whole environment has qualitatively extended, intentionally espousing aesthetic needs. 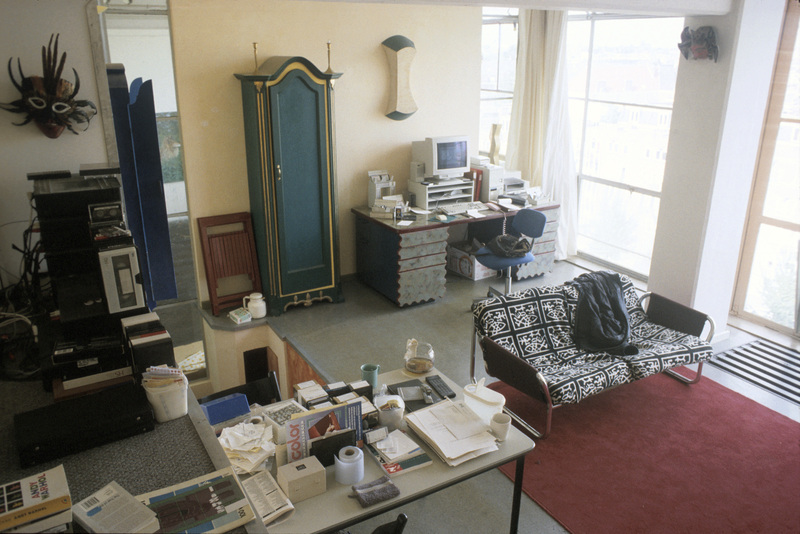 The desk (for personal and Vereniging admin) grew without prior design from its measured basic frame. 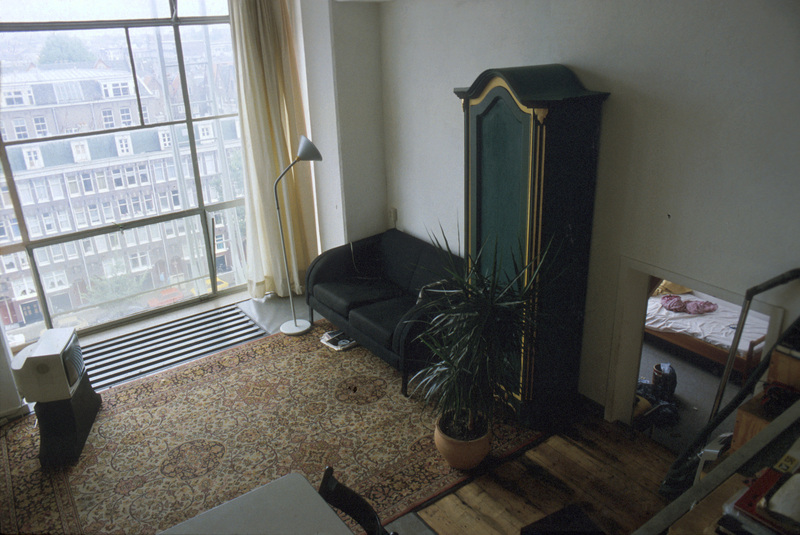 (Theo: “I’m not a good wood-worker so every mistake leads to another ornament”). 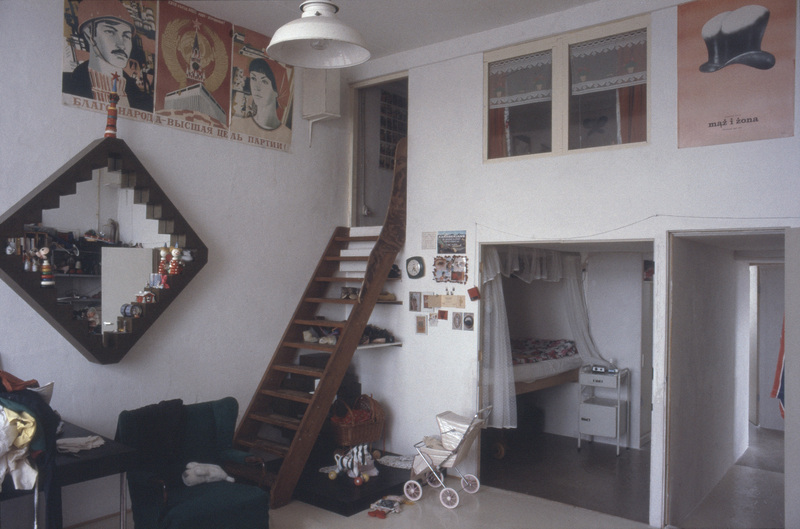 At the apt's S end a small door (original fire escape) opens into Theo's children's room: a one-dormer portion of the adjoining Hartcamp building's east roof [hc-L5]. Because the apt's floor is raised the door appears miniature or 'mysteriously' sunk, an apt entry from a child's book! 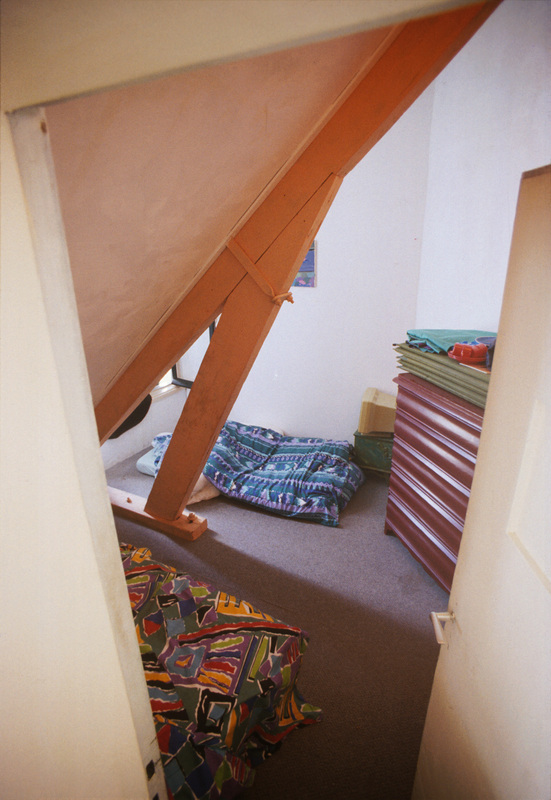 At the junction of bed-platform and 'sunken' door to the hc-L5 children's room is an 'object-stair' (later painted red) - one of the apt's practical objects that originated in Theo's paintings. View of the apt through the children's room entry door and up the steps onto the raised living-room level. The children's room through its entry door, looking down from its entry-steps. 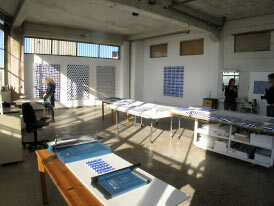 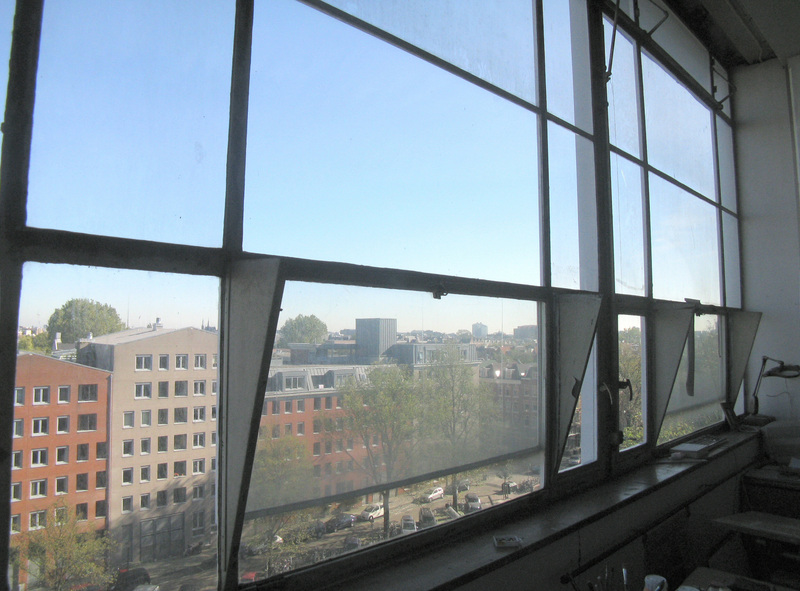 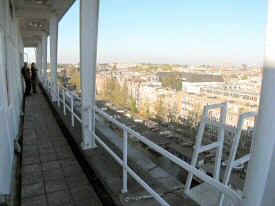 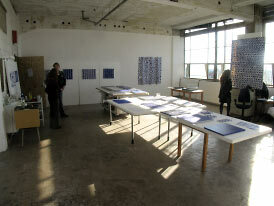 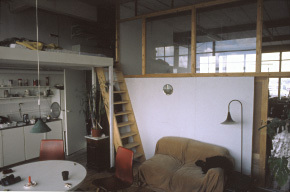 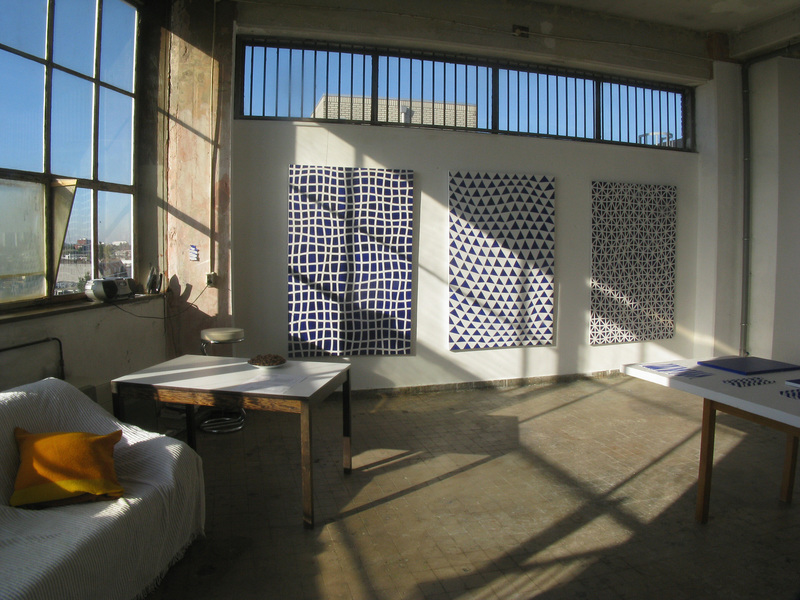 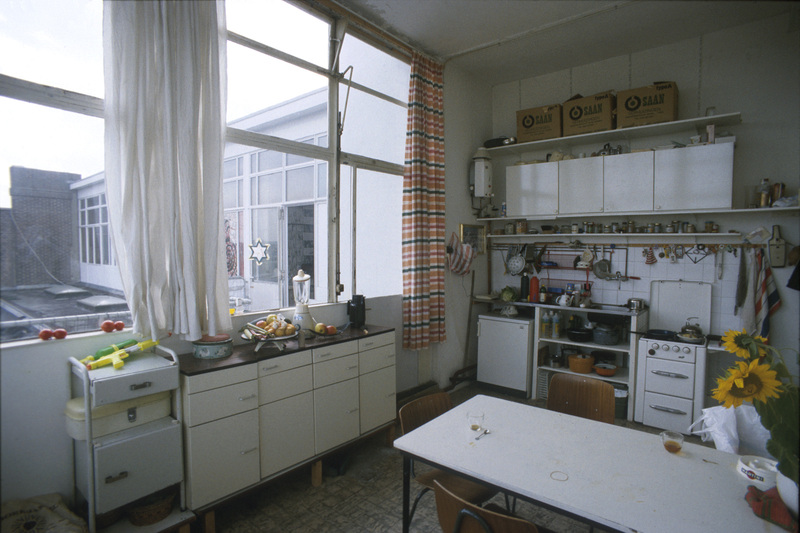 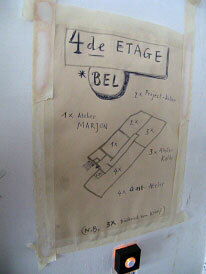 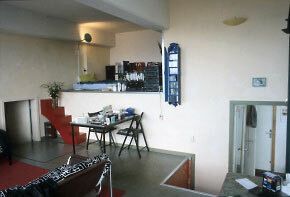 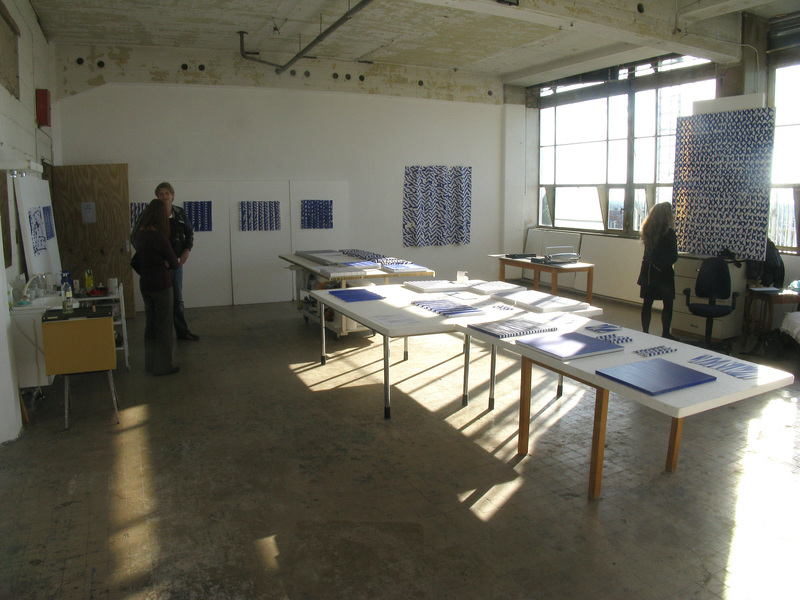 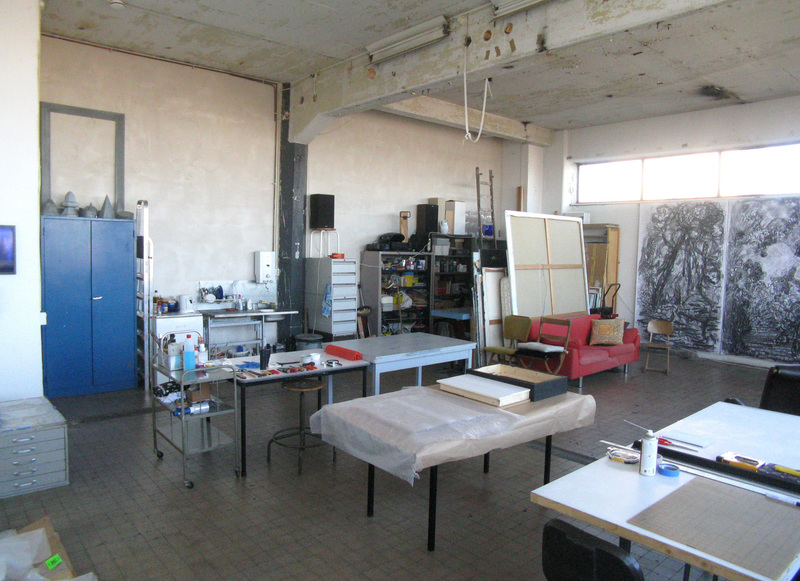 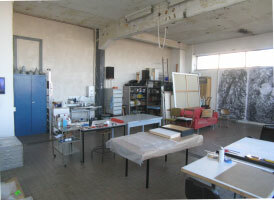 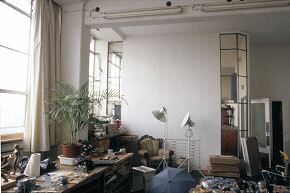 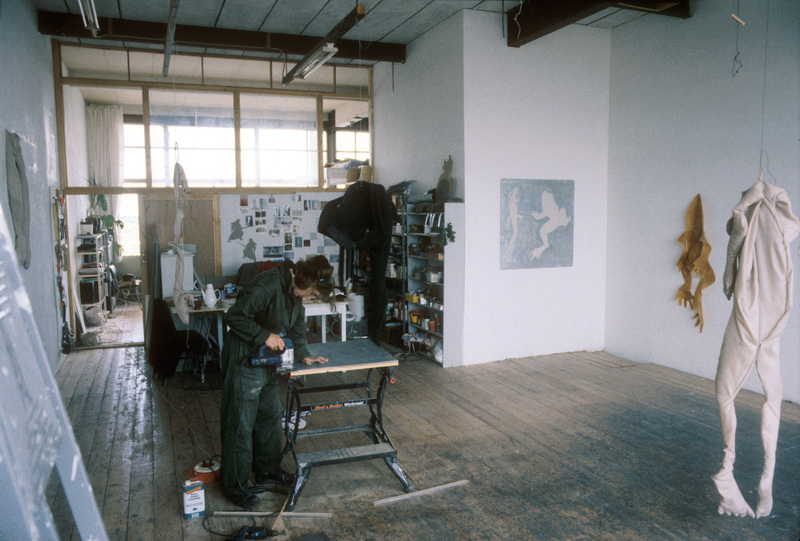 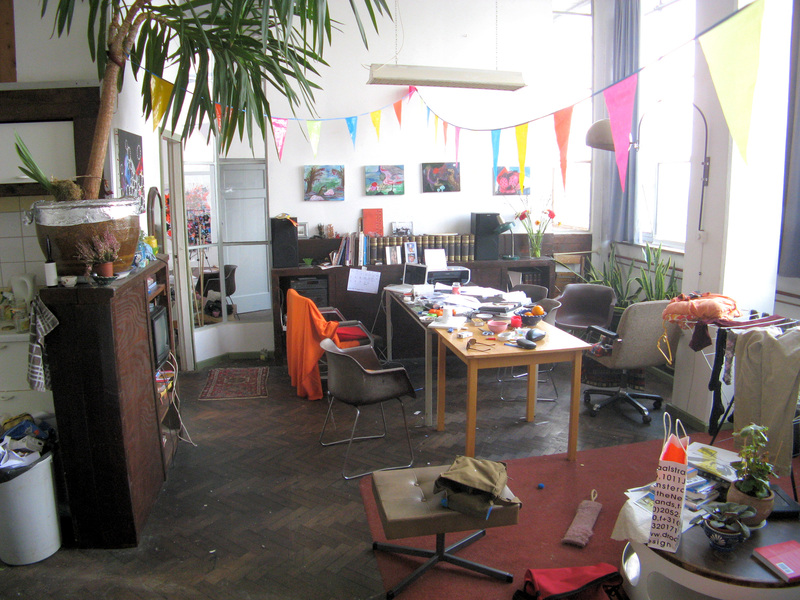 The establishment of a fixed-period rentable studio-apt for Amsterdam-visiting artists (the "M4gastatelier" plus its administrative Foundation) was a radical decision that initiated a third category of space-use, an alternative to work-spaces rented by outside 'commuters' or the homes of enclave-approved residents; it also brought the concept of an externally rented work-space (albeit softened by a degree of residential inclusion) into the domestic realm of the locked upper-floor enclaves. 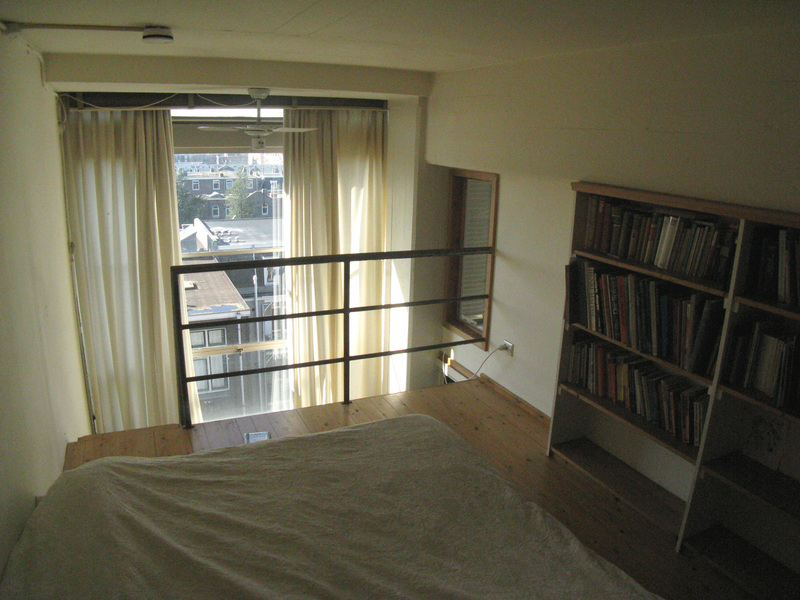 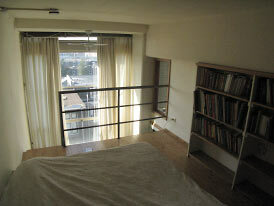 Its inception in 2005 involved the conversion of the above studio-apartment of a former Tetterode resident. Except for Theo's dividing wall between studio and living-space, almost all his architectural modifications/initiatives have been removed, and the space reduced to (almost) its basic shell. 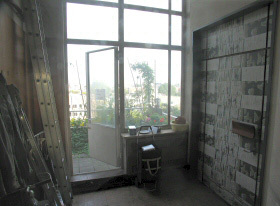 His living-area floor, raised to windowsill level (which afforded his domestic space a superb glass wall), is gone (no longer a magnificent city view beside ones low chair) and the entire space is now on its original 'factory floor'. 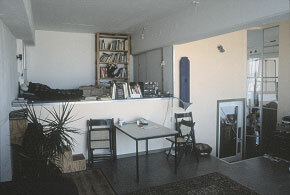 His stepped and complex windowed corner entry from studio to domesticity is now a mere door between one use and another. 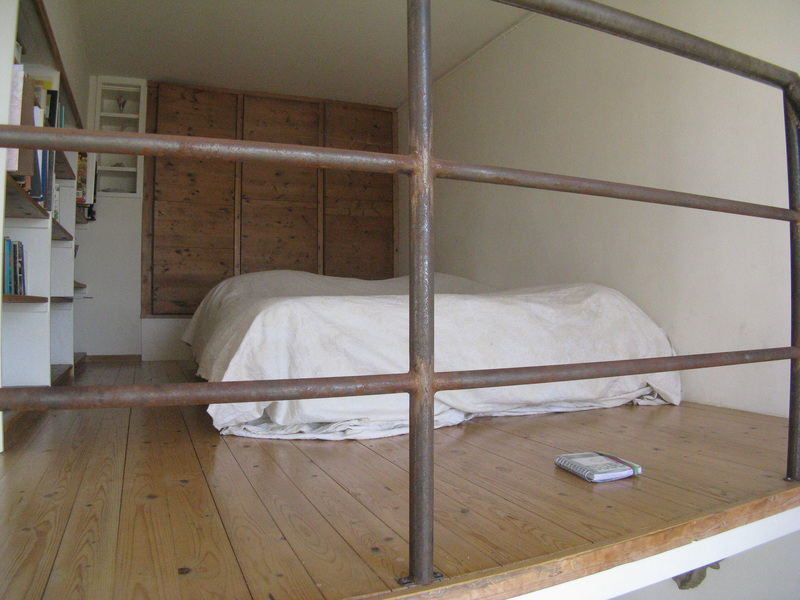 His 'sunken' children's' room - the strange little dormer space purloined from Hartcamp has become the 'guest' artist's bedroom and Theo's bed-platform (over his studio-store) is gone - the reclaimed floor-space accommodates a kitchen. A new store - a utilitarian 'non-designed'  excrescence - now thrusts into the studio from the face of Theo's elegantly designed dividing wall, hiding its east-corner window and deleting its subtle relating to the building's glazing. 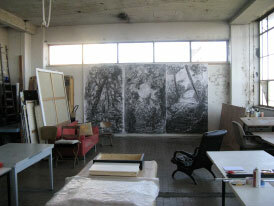 The M4gastatelier artist whose work appears in the pictures below is Nina Bovasso from New York. 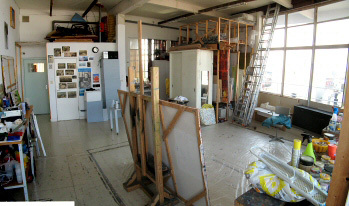 The pictures were taken during her preparations to leave (which included an 'open studio' party) - thus they do not show the space in its normal working/domestic state. 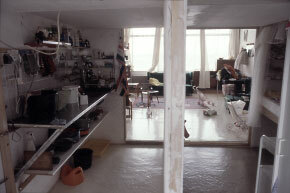 The store is 'non-designed', and thus resembles improvisation, but because conceived impersonally, simply as a necessity for others, it lacks the qualities of a work which grew according to personal need: a desire that inevitably expands from satisfying a simple physically practical necessity to include judgments of the beauty/efficacy of living with this necessity in ones surroundings. 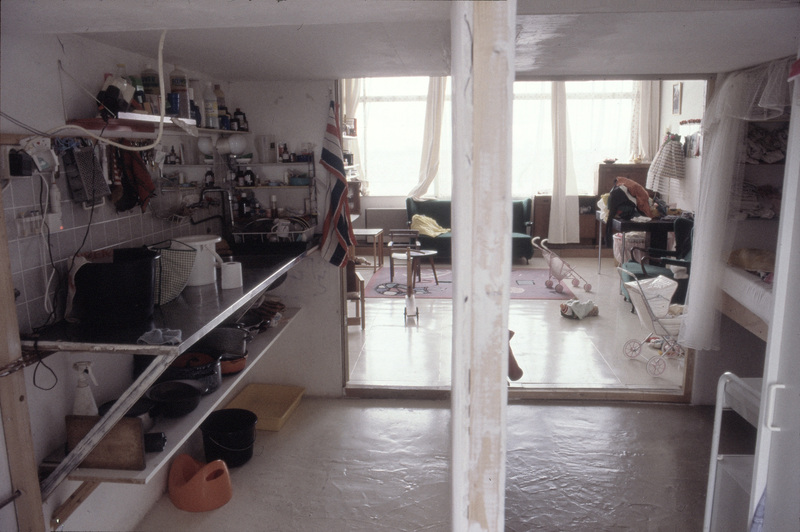 It is also not designed like architecture: a considered response to visualising a stranger's experience of using a whole place/space - an attempt to open its inherent practical and experiential potentials. 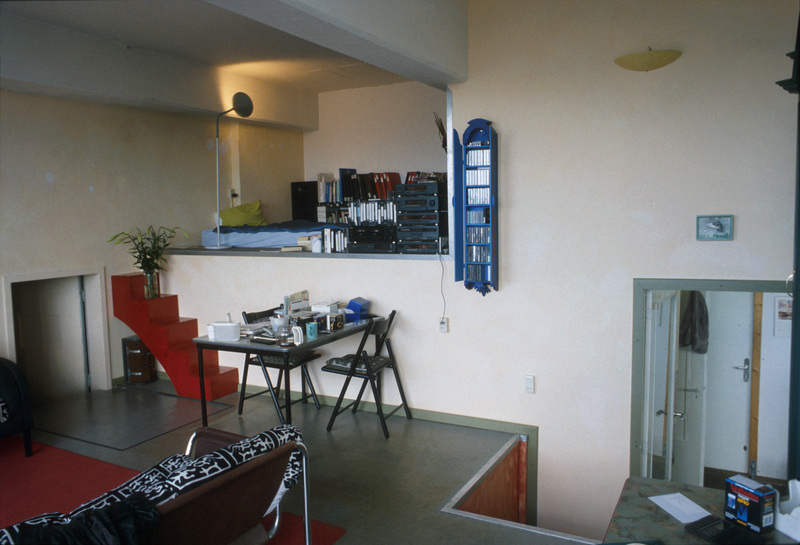 This store thus conveys nothing but crass necessity that heedlessly mutilates an existing coherence: Theo Leijdekkers' sensitively articulated dividing-wall. The south end of the studio, which was previously an elegant glazed wall that signalled to the studio the presence of an apt [ref previous section - pic1], now bulks forwards as a storeroom - a clumsy intrusion. 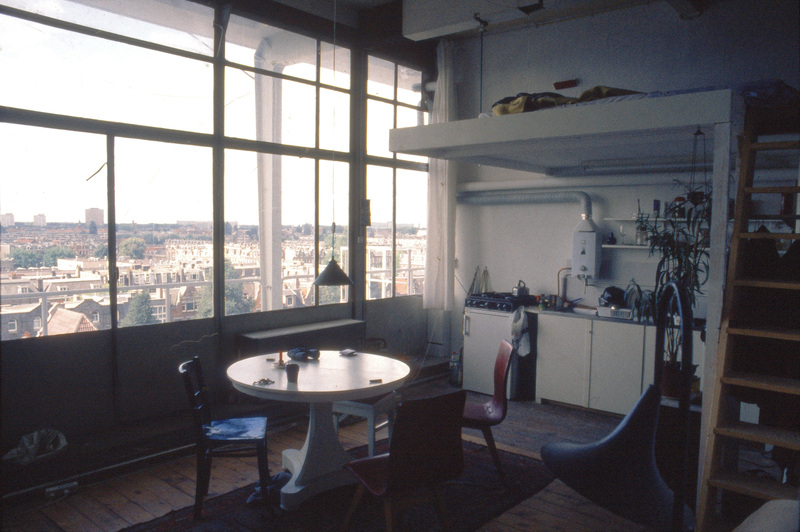 The removal of Theo's raised floor in this domestic area and the consequent return of its windows function to 'light' rather than 'view', has unified the entire space and defaulted this domestic portion from 'luxurious city apt' to 'converted factory workshop' [ref previous section pics]. 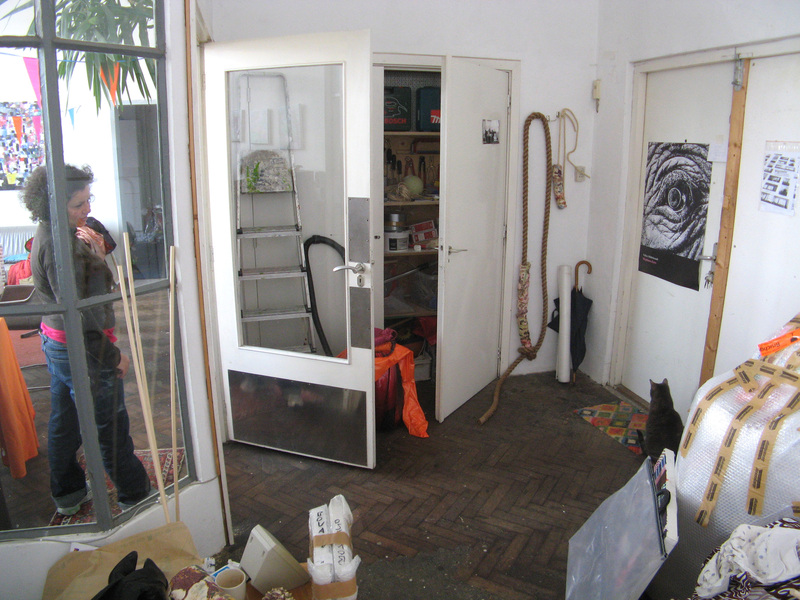 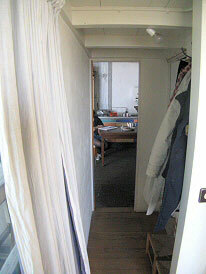 The entry door from the studio is at the NW end [pic: The space gained (both floor and volume) by the removal of Theo's studio store, on which his bed reclined, houses a new kitchen. 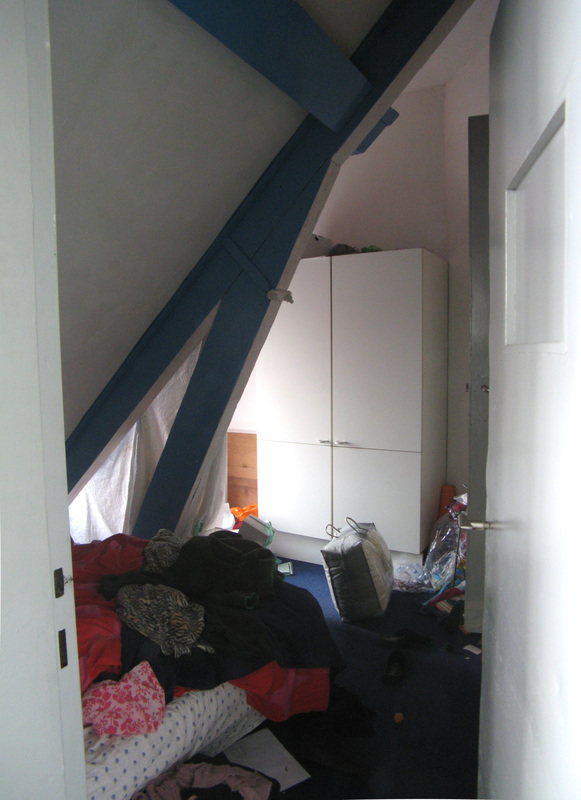 At the far end is a door through the dividing wall between Merkelbach and Hartcamp, into a small space under Hartcamp's dormer roof, now serving as a bedroom. Now that Theo's switchback floor has been removed, this little eaves room, hollowed from neighboring Hartcamp's space is continuous in level with the rest and its sense of 'mysterious sunken cave' is erased. 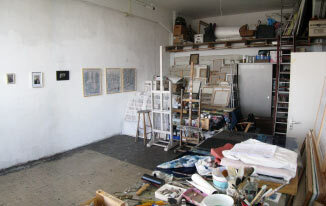 Since 1988 or 89 Kathy has used this space purely as a studio - she has made only minimal changes over that time. 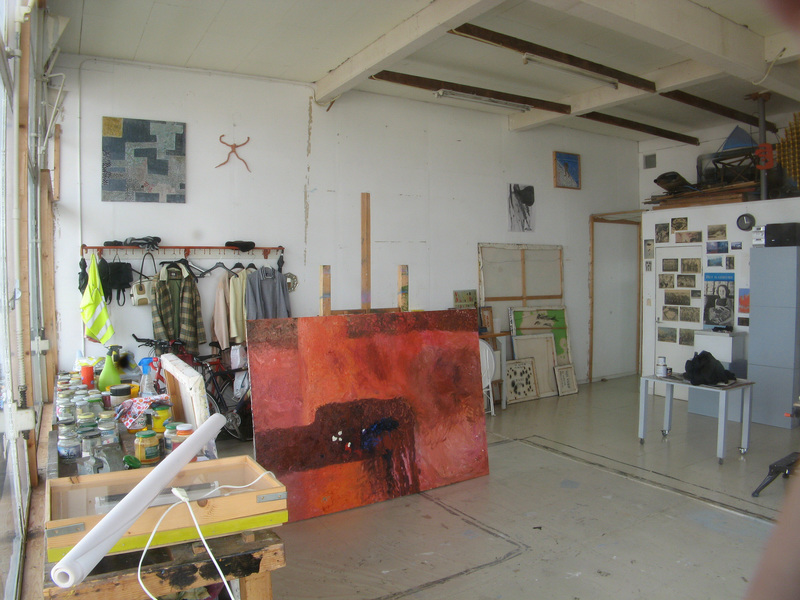 She now shares the space with another artist  (never working with the other present) - hers is the south half, his the north half. 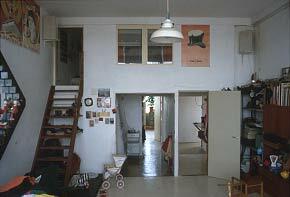 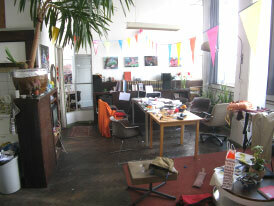 Mikel van Gelderen whose live and work space on Hartcamp L4 remade as a purely domestic apt in 2005. 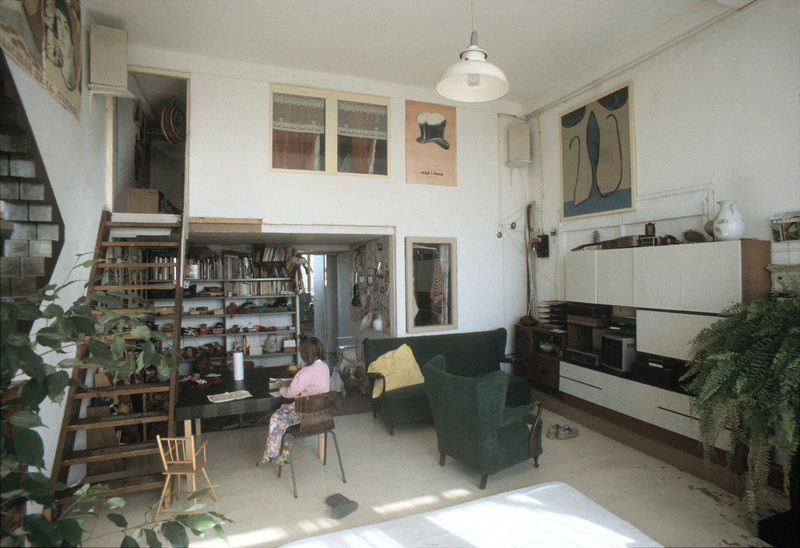 In spite of the fact that her space's entry opens only 3m from the enclave’s shared wc/shower and kitchen, Marion is making a complete ‘home-like’ domestic facility inside her studio - piquantly illustrating Tetterode’s trend to self-contained living-spaces! Note the wc/shower compartment inside this little ‘house’; cooking facilities are also newly installed but ‘outside’ in the studio. 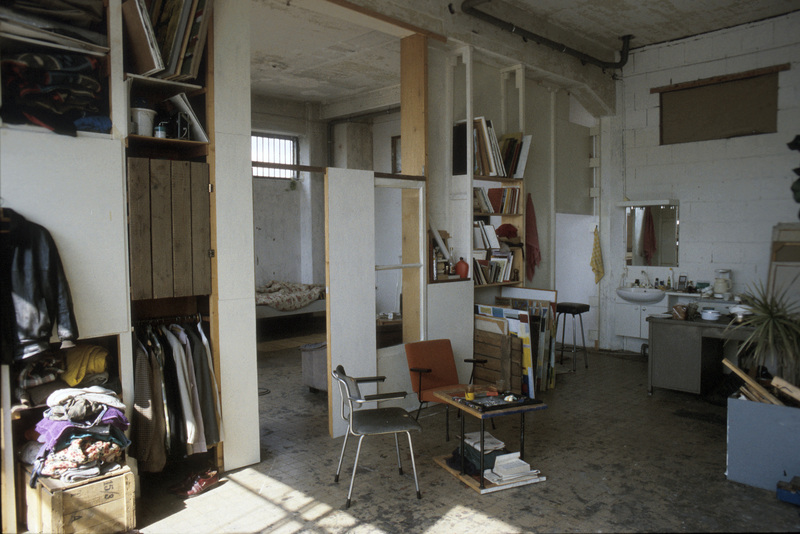 A studio-apt saves expense, and also in this case furthers her wish for a completely private space after a life spent sharing facilities at home, school, and squat-living. 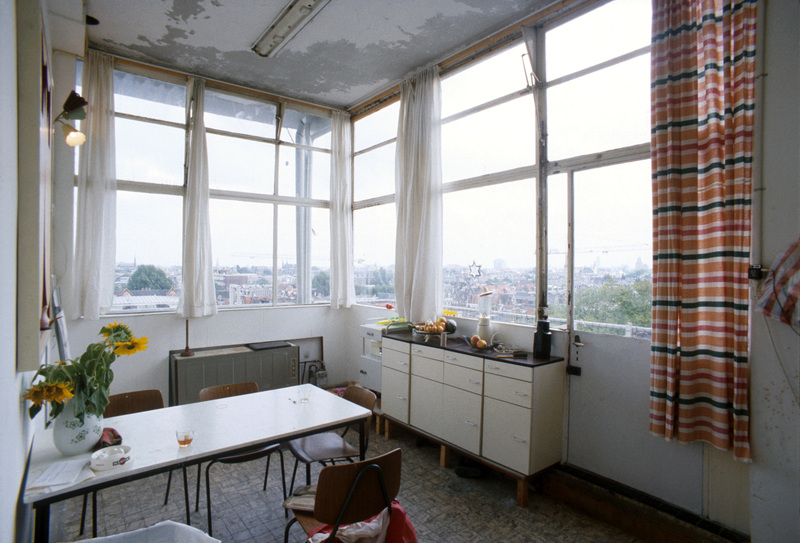 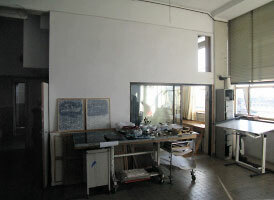 She has used a studio on this floor since December 1986, sometimes sleeping on its couch, but living outside Tetterode. 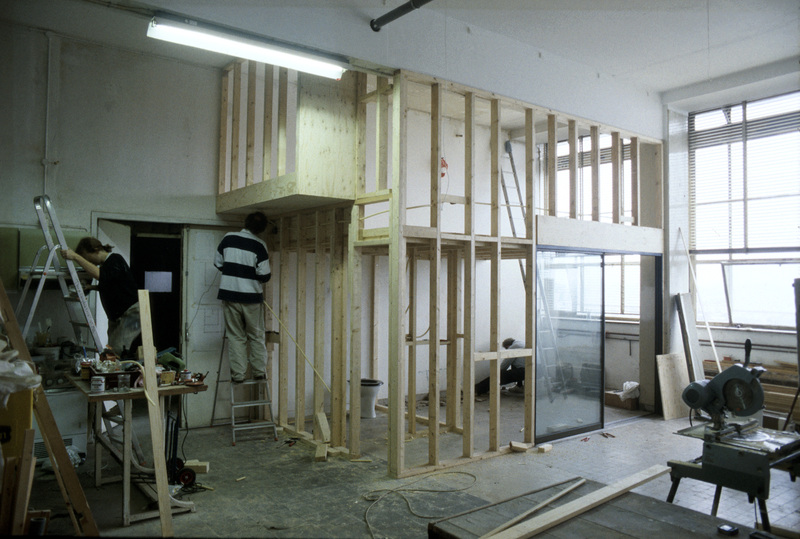 This little ‘house’ was begun in summer ‘93 - it was visualised and sketched, not formally planned...she wants it to convey a sense of physical and visual continuity with the studio; to see her work from inside it. 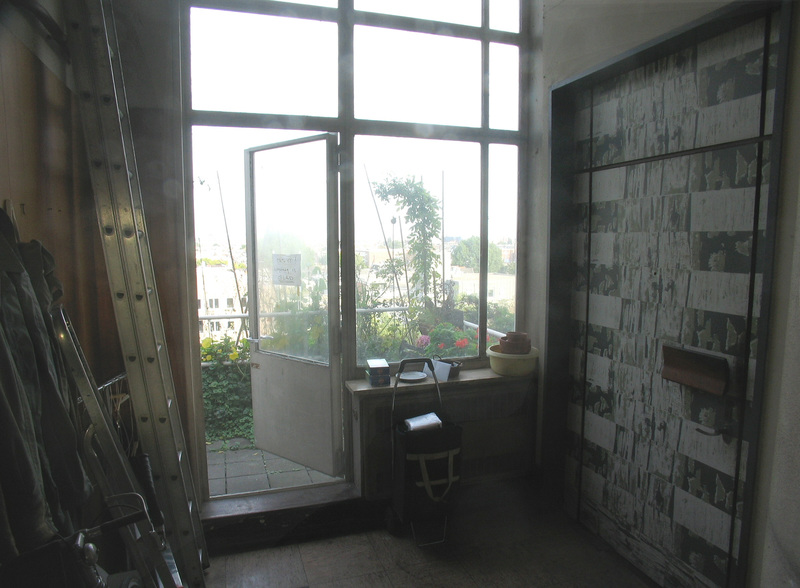 It is made of new wood with second-hand windows and fittings; the studio’s cement-block walls have been plastered and the whole painted. 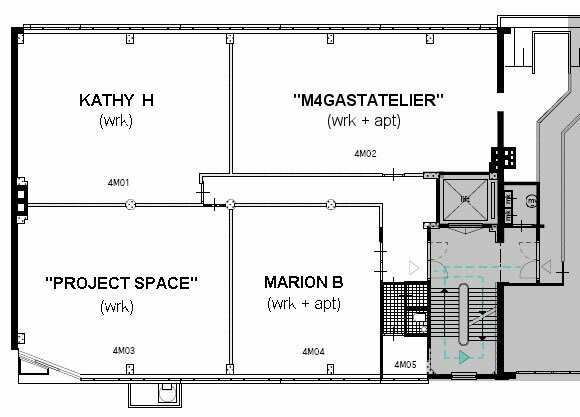 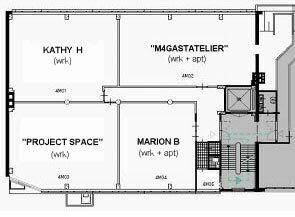 This is a very orderly and tiny version of the Merkelbach living-space type: 'a home built inside a studio' [for an extreme comparison see the huge mb-L2 living-space of THOM & BEA]. Unlike the latter, here there is no struggle between studio and home - no competition for space, the apt-facility is simply part of the work-space, transparent to it and an object in it, as practical a working-tool as the electric-saw. 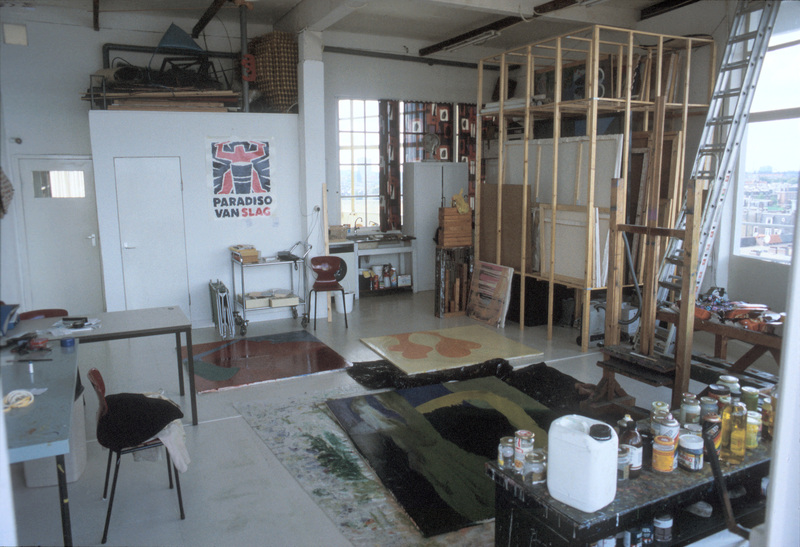 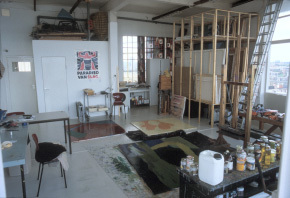 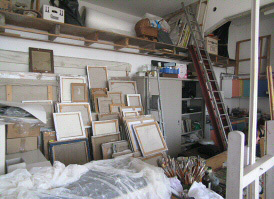 Marion began building a 'house' inside her studio in summer 1993. 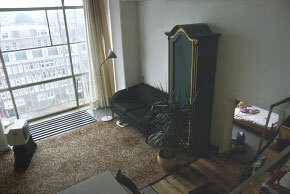 The design is assisted by Frans P, an architect. 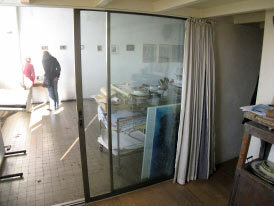 The entry into this studio/house is through the south wall (just left of the house). After the studio's house was completed Marion lived in it for about five years, until the school age of her eldest child. 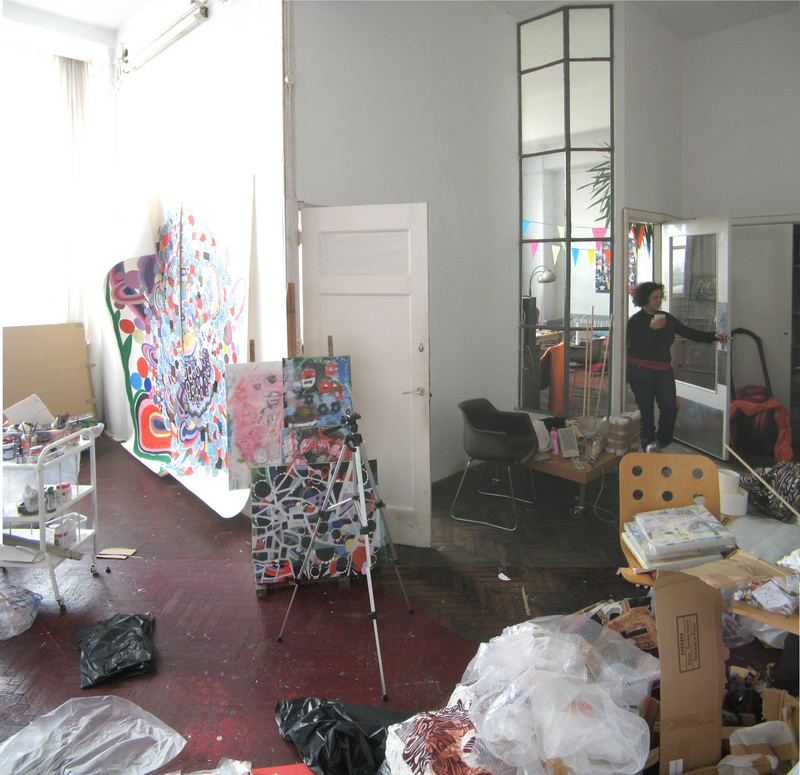 From that time the studio has been shared with other mothers. 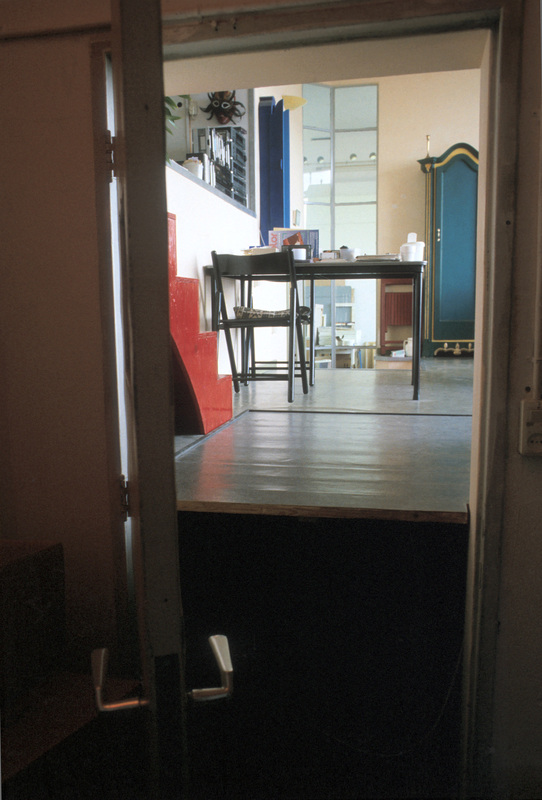 View out through the studio-apt's (south-pointing) entry door, across the enclave's lobby, through its entry-door and across the central-stair's landing to the Hartcamp enclave (hc-L5) entry-door opposite. 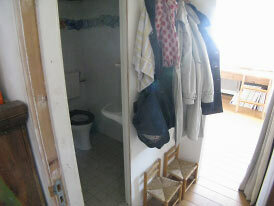 [The house is off pic right.] 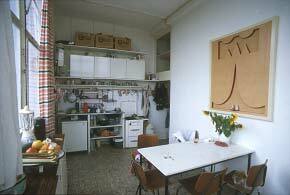 The kitchen and dining table fill the apt's SE-corner, in the space beside the enormous 'cupboard' of the house. 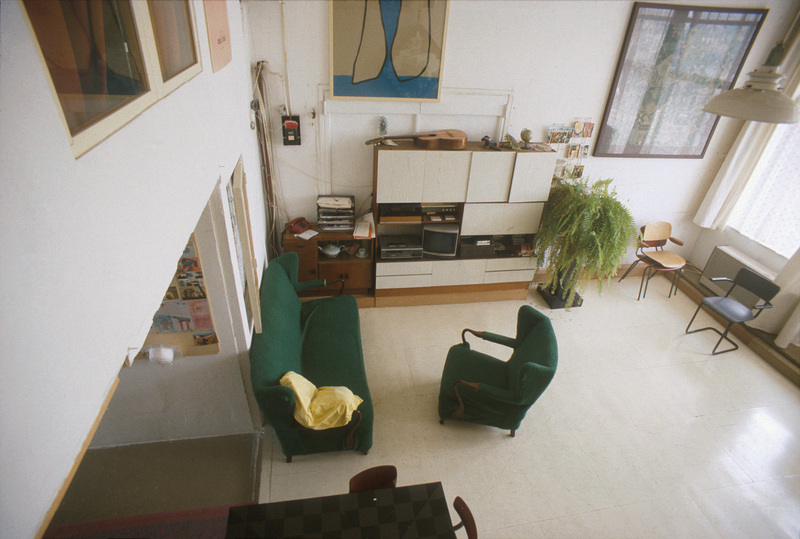 The exterior of the little in-studio house seems not to have changed since 1993 (see above). 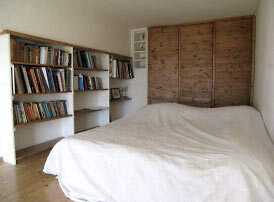 The house's east-wall's large and small box-like extrusions are the bedroom's wardrobe and small shelf-unit [see below]. The house's east entry door opens into a small lobby with a wc/shower room. 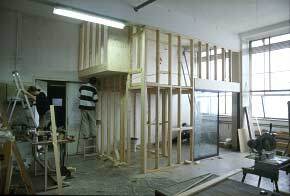 On the left is the small wc/shower room; at the far end is the mezzanine stair lobby (also entered through the north door from the studio). 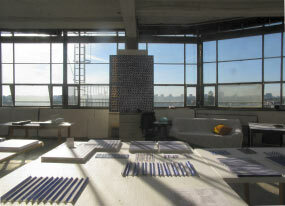 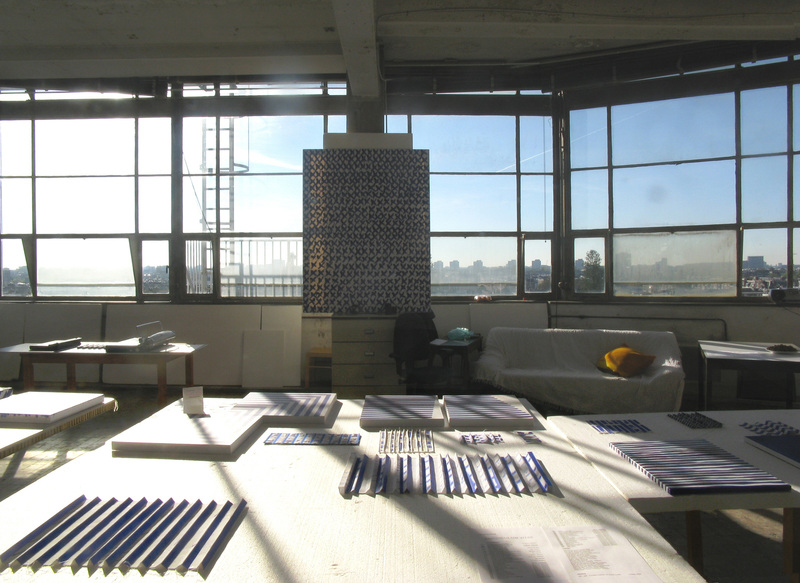 View of the studio from the mezzanine stair lobby. The big wood-doored wardrobe and the tiny shelving niche to its left push their box-like forms beyond the mean surface of the wall. The topmost Dacostakade living-spaces are in the glass and steel 'penthouses' - the one over Hartcamp was the directors' dining room, this Merkelbach one was the workers' canteen. 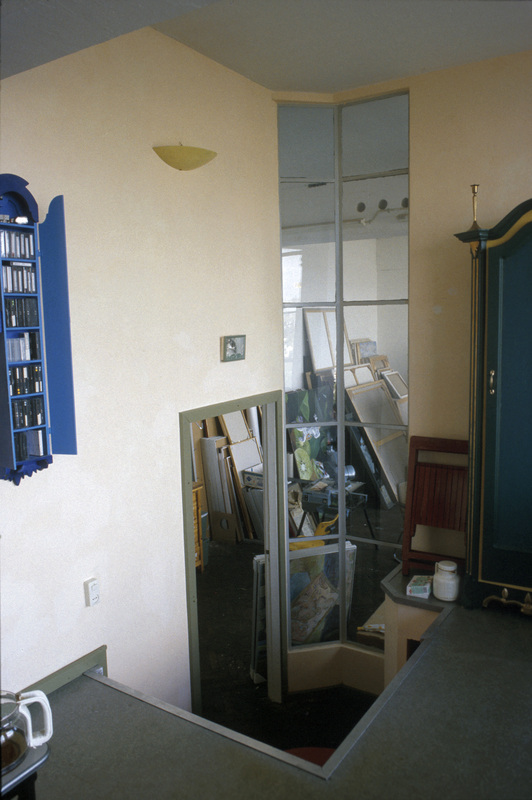 This ultimate Merkelbach floor is now sectioned into three, one home and two studio apts, entered, not by way of an internal enclave passage branching from a centre-landing, but through 'front-doors' off an external railed 'pavement'. 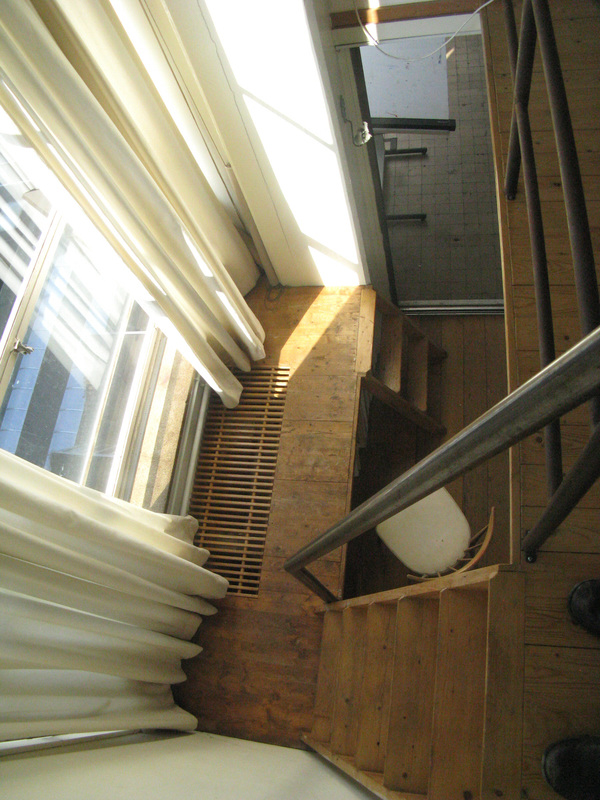 This vertiginous path with its minimal railing 29m over Dacostakade is reached from the central-stair's L6 landing through an outside door. 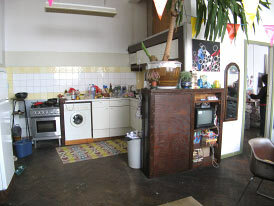 This is Tetterode's unique example of 'row-houses' [ref: De Loods / Edelweis as main examples]. 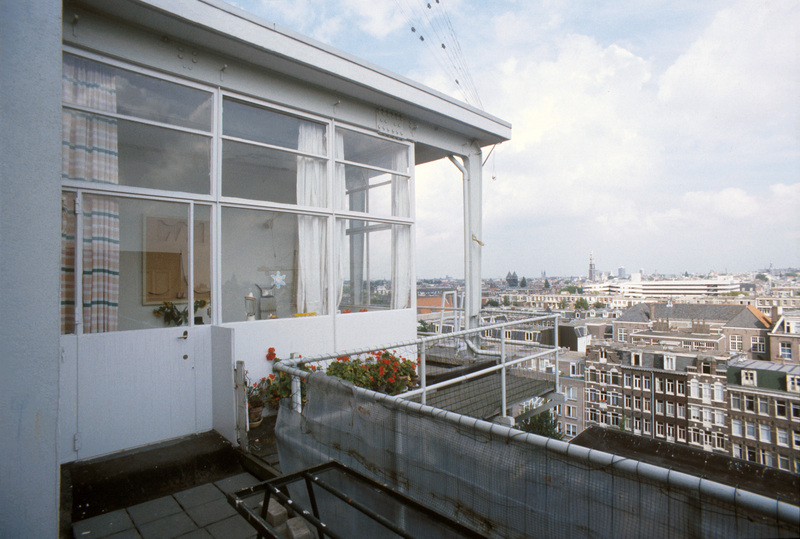 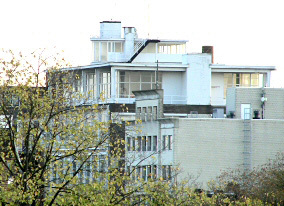 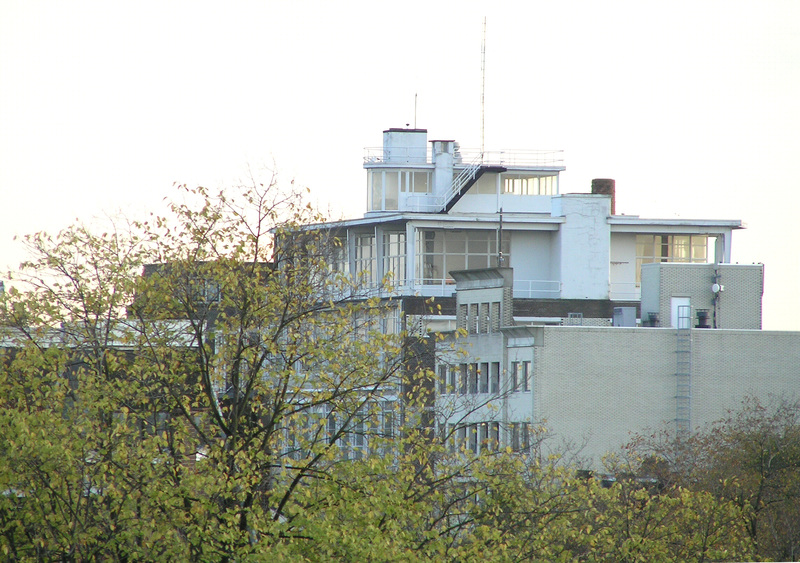 Merkelbach's 'penthouse' [L6] surmounted by his 'look-out' pavilion [L7] whose roof-terrace [L8] supports the Tetterode radio station's aerial. On the left is the 'front-door' of Anita Moll's home; continue along the east-face walkway to the entries of the two other living-spaces in this divided 'penthouse'. 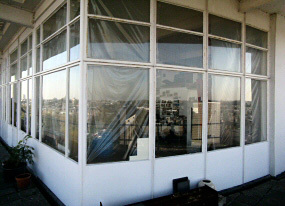 The entry-door from the penthouse terrace walkway is in the south wall. At the kitchen's far-right corner (beside the cooker) an opening connects with the under-mezzanine passage to the living-room. 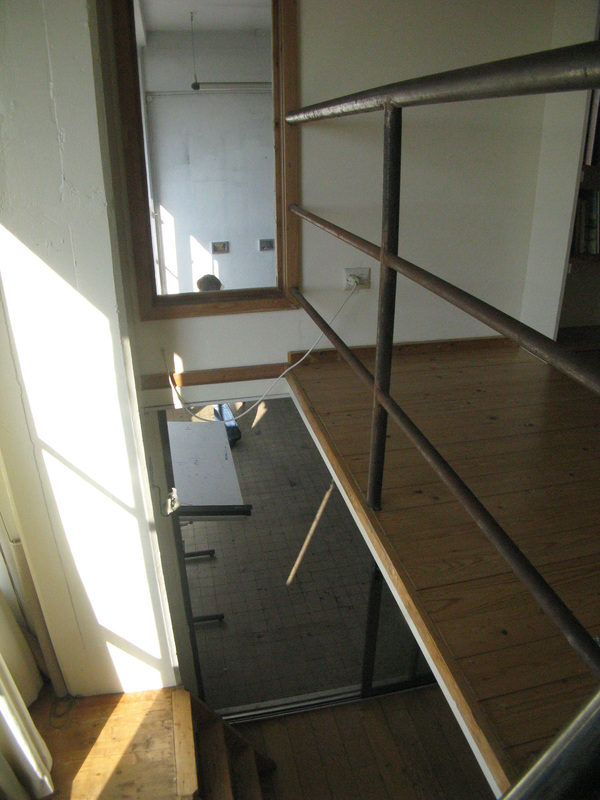 We are standing near the studio entry to this space under the mezzanine that connects to the west side living-room. The 'post' in the centre is in fact the end of a wall that divides it into two passage-ways. 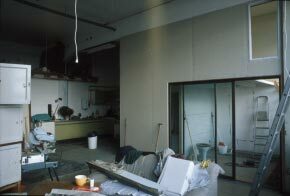 Off-pic to left the kitchen connects via an opening at its west end. 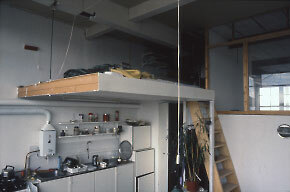 The under-mezzanine bisected space from studio and kitchen emerges into the living-room under the mezzanine bedroom's walled and windowed facade. 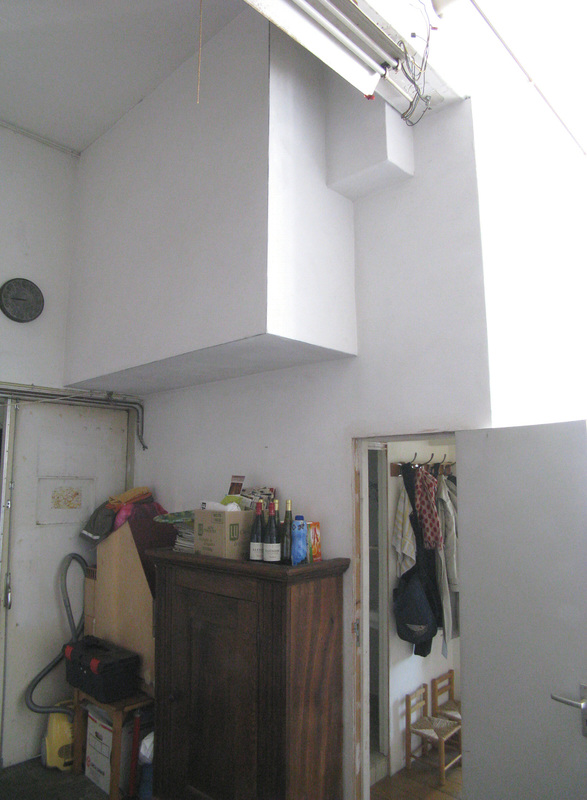 During the year since the last two pictures there have been changes to furniture and fittings and structural, spatial, functional alterations. The living-room has been extended under the mezzanine by removing the wall behind the stair that enclosed the child's bed-alcove, lining the resulting recess with shelves and fronting it with a table. 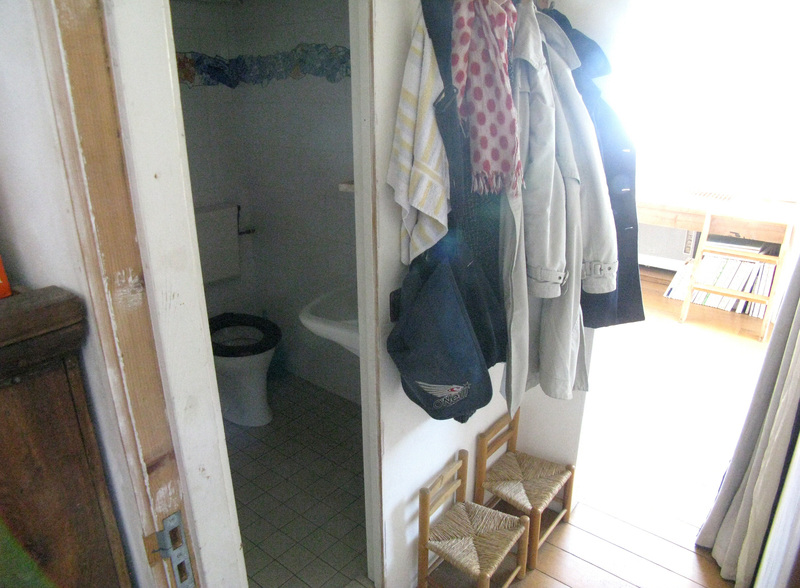 The strange dual passageways (one each from studio and kitchen) are merged, the kitchen's is converted to a bathroom/wc and its outlet blocked with a window. One effect of these alterations is to enhance ones perception of the living-room's functional and spatial continuity with, yet visual separation from, the east-side studio and kitchen spaces. 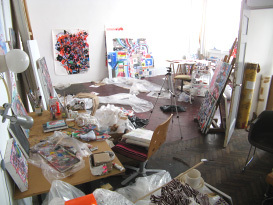 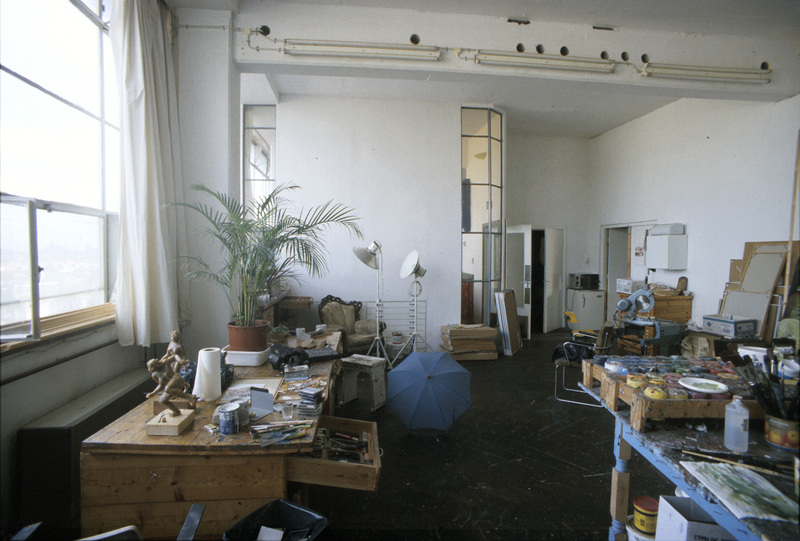 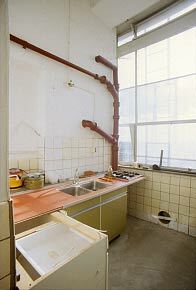 In c1984 Monica Leo took possession of the whole Merkelbach 'penthouse' and cleared it for use as a studio; she had found the space "totally" filled with dumped factory refuse. She later divided this huge room in half longitudinally and shared it with another. 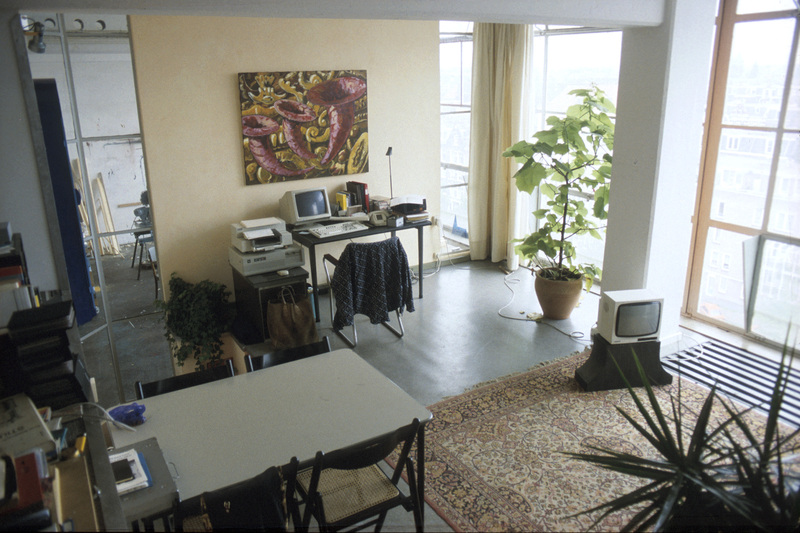 Still later the space was again divided, across its width into three sections, and in 1986 Monica began to both live and work in the N-end. 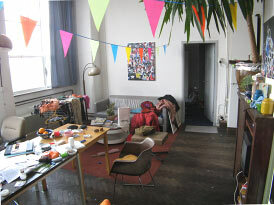 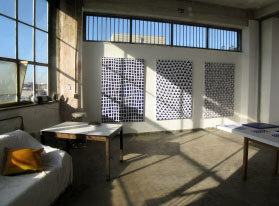 Domestic spaces usually change in large and small ways much more quickly and thoroughly than workshops and studios. 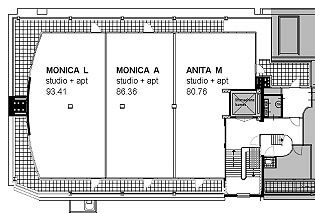 It seems that over 15 years Monica's studio has maintained a similar positioning of work-functions and even of some detailed placings.